If you are looking to book your Walt Disney World vacation, I highly recommend Get Away Today for booking your entire vacation. They have a layaway option if you want to make payments which is a wonderful way to afford a fantastic vacation! If you use the promo code Pencil , you can save $10 off Southern California packages, including Disneyland, Legoland and San Diego as well as the new Wizarding World of Harry Potter at Universal Studios Hollywood, when you book with Get Away Today. 1. 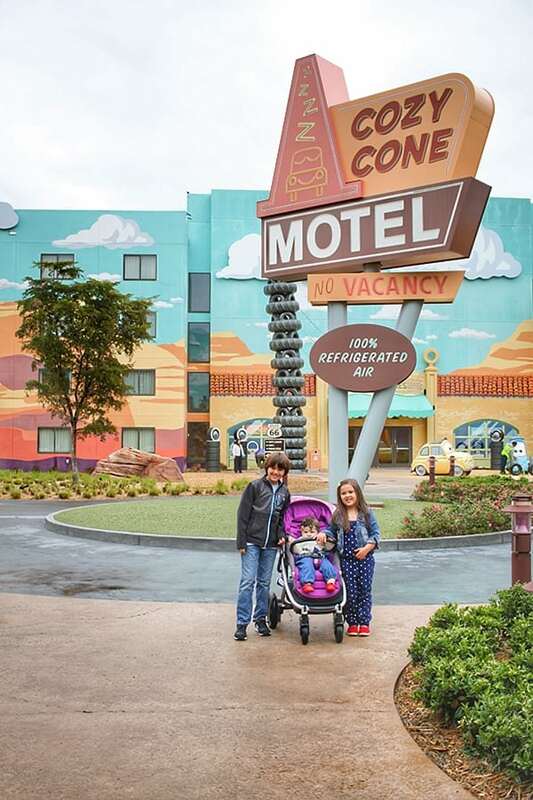 We highly recommend staying at Art of Animation – Kids and adults will be delighted with the theming of this fantastic resort. It’s almost like a little theme park itself. We stayed in one of the Cars family suites and were so incredibly comfortable. It had a separate bedroom for the parents, a pull out couch and Murphy bed for the kids, AND two bathrooms! Yes! 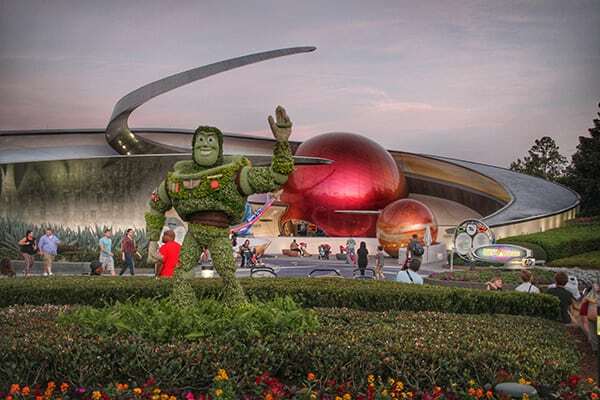 Art of Animation is one of the value resorts, but I would recommend it for any budget. The rooms and grounds are so cleverly themed, and you can choose from Cars, Lion King, Finding Nemo or The Little Mermaid. 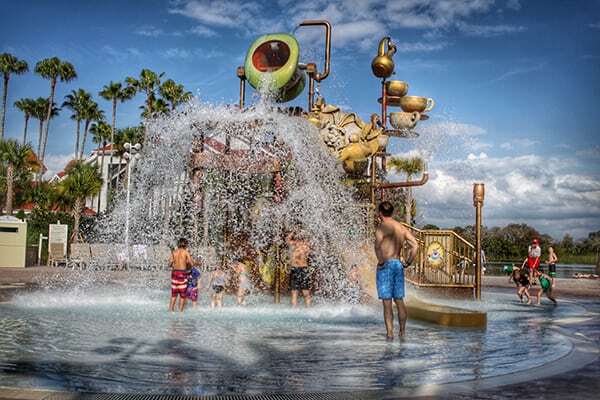 Each area has their own themed pool that kids and adults will go crazy for! 2. For a quick and delicious dinner try the pasta bar located in the Landscape of Flavors, the resorts quick dining option. It was a hit with the entire family! 3. 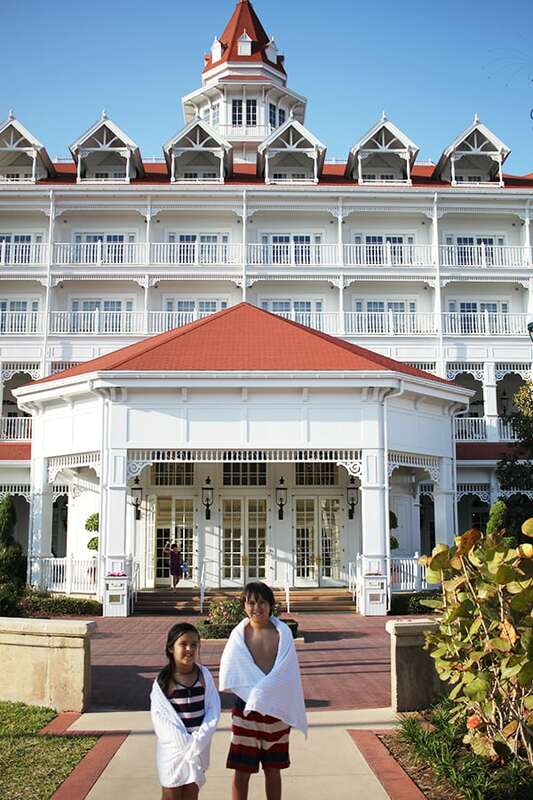 Grand Floridian – This gorgeous resort is a Disney icon. It’s truly beautiful from the grounds to the rooms. Just look how pretty it is! We stayed at Art of Animation for the first two nights and Grand Floridian for four nights. They were both so fabulous! I’m glad we got to experience both. 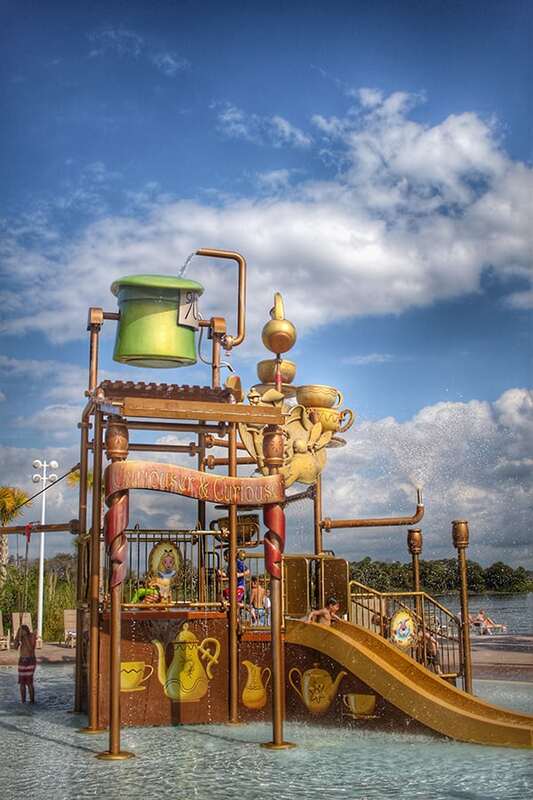 We loved the beautiful pool, and especially the gorgeous Mad Hatter themed water play area. It was so cool, and right on the other side is a little white sand beach! 5. Bring Swimsuits, even in the winter! – It was warm enough to swim in February! 5. Monorail – One of the best things about staying at the Grand Floridian is the use of the monorail to travel to the Magic Kingdom. 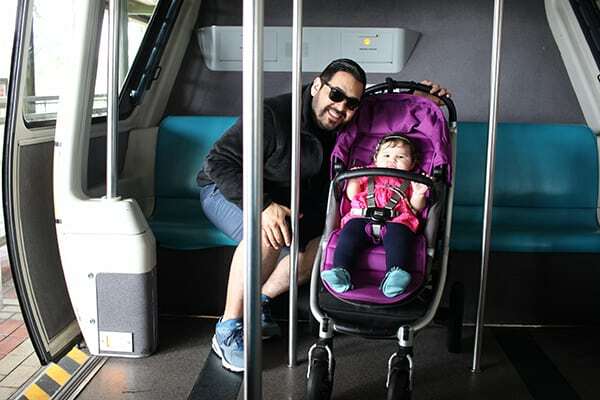 The monorail is incredibly convenient when traveling with a stroller. You can just roll it right on instead of breaking it down. Lots of photos at Disney World are a must! I purchased a new wider angle lens for my Canon that I was really thrilled with. It’s inexpensive and lightweight, making the camera super easy to carry. I love the wider angle and was able to fit more in the frame of my pictures. The f-stop is low enough that I can get bokeh and use it in lower light. Most of the pictures in this post are from my Canon . I use my iPhone a lot for pictures as well, especially when asking somebody to take a family picture of us. 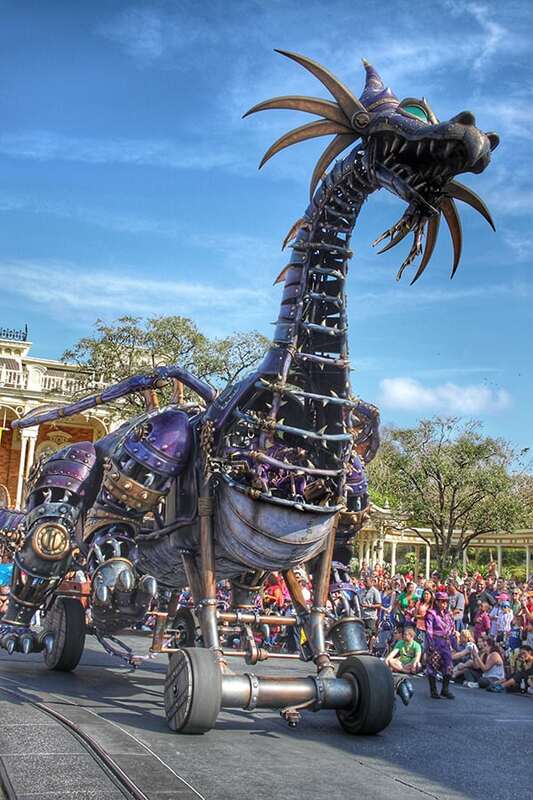 7.Don’t miss the Festival of Fantasy parade. It is just so stunning and unique. Grab a spot early for the very best views. 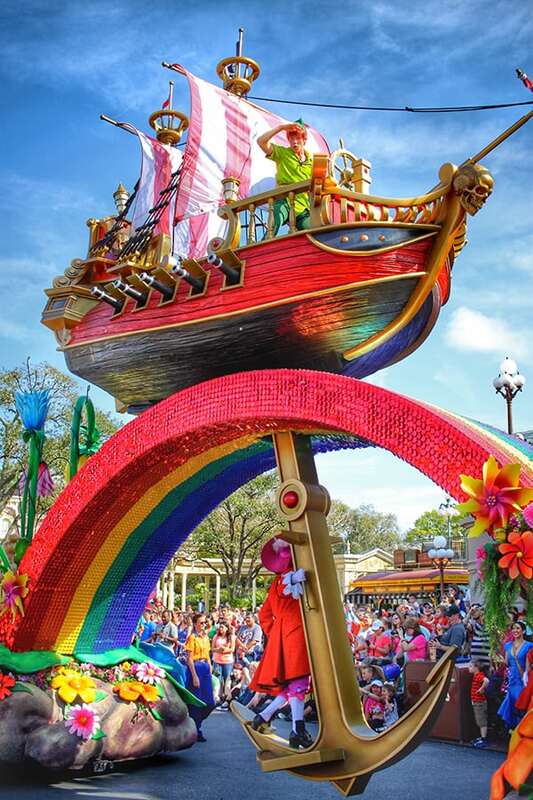 Disney has really outdone themselves with this parade. Peter Pan was my favorite! I just love the rainbow! 8. Eat at Tony’s – Located right off Town Square in the Magic Kingdom. We grabbed a late lunch here and it was one of our favorite meals. 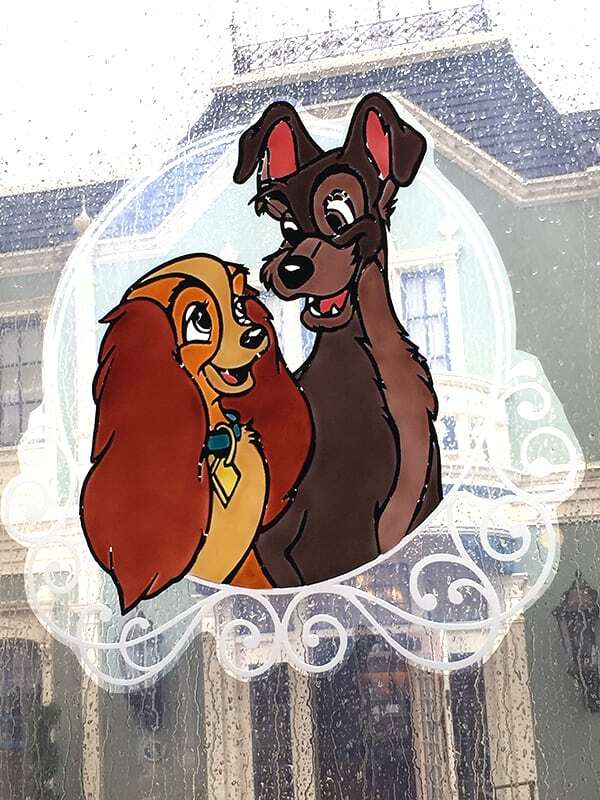 The Lady and the Tramp decor is completely charming, and if you get a window seat the views are especially beautiful! The pasta dishes were a hit with the whole family. 9. Mickey Mouse -there are several places to meet Mickey at Disney World, but the Mickey right next door to Tony’s in the Town Square Theater is the only place you can chat with Mickey, and possibly see a card trick! 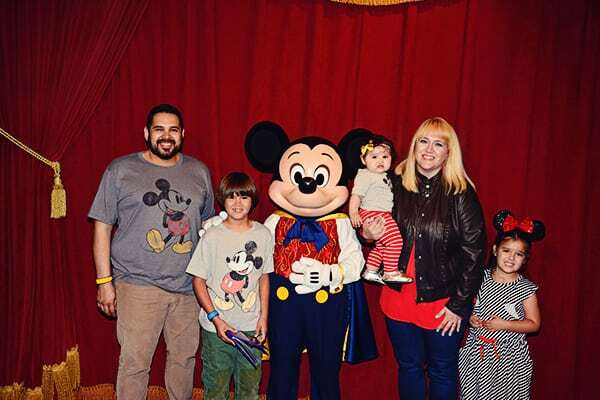 Our five year old wasn’t too sure about Mickey and she wouldn’t stand next to him, but the next day she was begging to go back! 10. 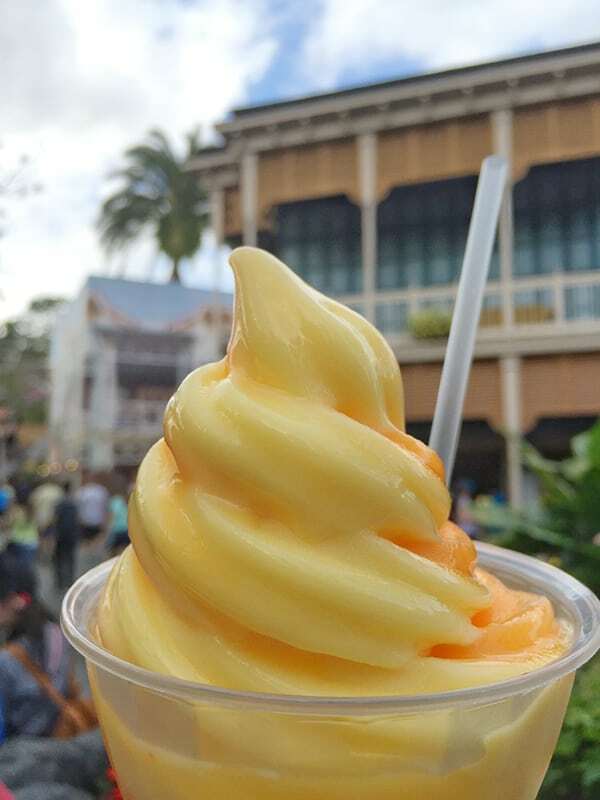 Treat Yourself to a Dole Whip – The Dole Whip is a Disney icon and a must-have! It is pineapple soft serve, and you have the option of having it in pineapple juice as a float. It’s so refreshing on a warm day! I almost always treat myself to one at Disneyland:0) I was absolutely thrilled to see even more options at Disney World – orange and vanilla. Yes! I swirled my pineapple with orange soft serve and it was amazing! My son had the orange and the vanilla swirled together and it was so good! Like a delcious 50/50 bar! 11. Ride The Seven Dwarfs Mine Train (more than once!) 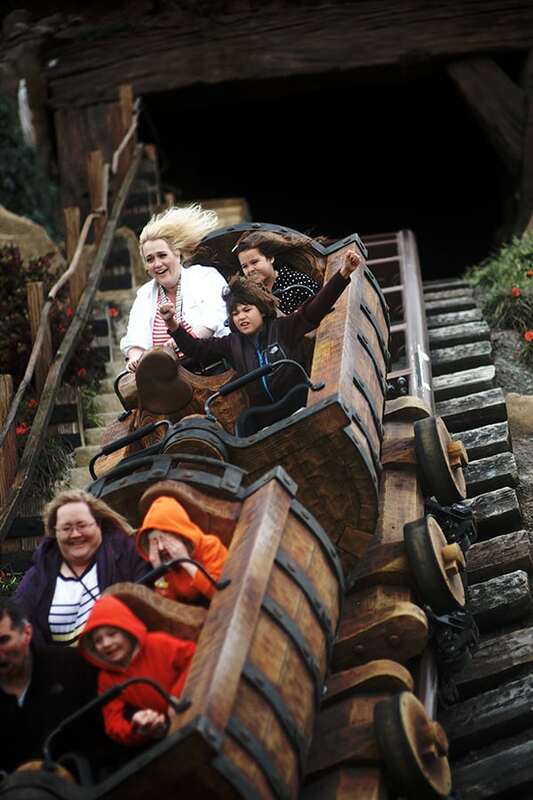 – The Mine Train is the newest ride in the park and you will want to ride this more than once! 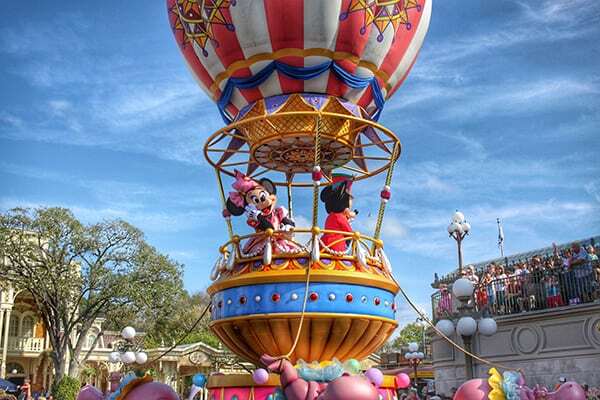 The lines for this were always long, even first thing in the morning and in the evening, so this is the perfect ride to reserve on your FastPass+ system. My kids are still talking about how much they loved this ride! It’s the smoothest roller coaster we have ever been on, and we loved the Snow White theming! We suggest riding it during the day and during the night. This picture is from the Memory Maker photo package I bought before the trip. 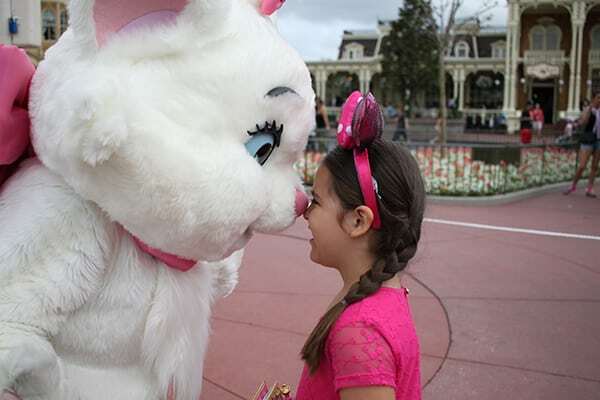 It was linked to our MagicBands and we were able to download the pictures and a fun slow motion video. The best quality pictures and video were the ones taken during the day. Pretty sure the kid next to my husband knew where the camera was! LOL! 12. Grab a bite at Pinocchio Village Haus – located in Fantasyland right next to the Cinderella’s castle, we found this a lovely place to grab a quick bite. The salads and flatbread pizzas were very good! I really enjoyed relaxing in the outdoor seating and taking in the view of the castle and the lovely atmosphere of Fantasyland. It’s a beautiful spot to have lunch or dinner! 13. 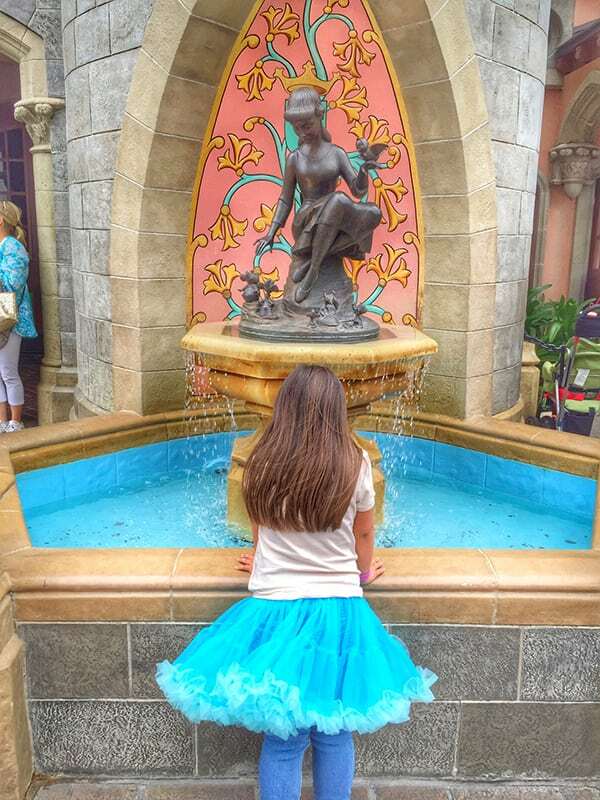 Character Pictures – My very favorite character pictures from our trip are the ones we took outside. If you download the My Disney Experience app before hitting the parks, you can find the characters’ schedules and plan accordingly. 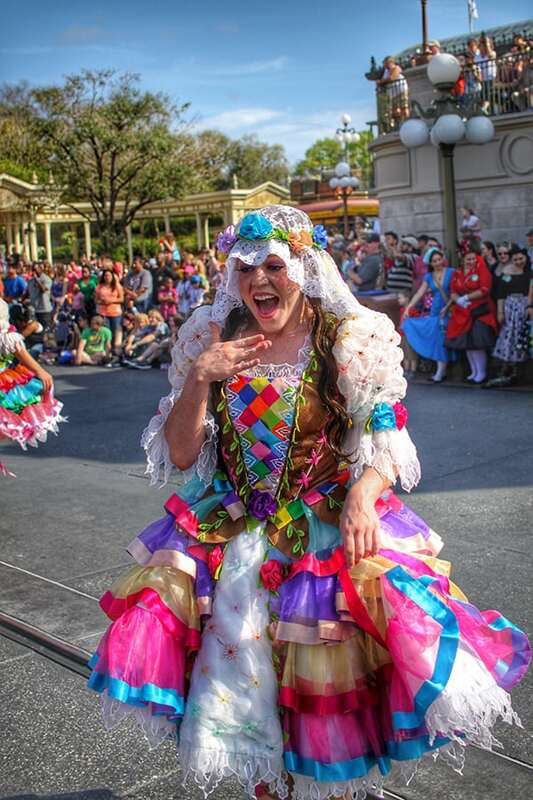 Marie was one of our top must-meet characters since we have never seen her at Disneyland! Eeeek, isn’t she just adorable with my little girl! 14. Gaston’s Tavern – Another favorite from our trip was Gaston’s Tavern, a new snack area modeled after the tavern in Beauty and the Beast. Located in the expanded New Fantasyland, Gaston’s Tavern is so fun inside with a huge antler horn chandler and an over the top portrait of Gaston. The tavern was busy all day long, but we had the place to ourselves right before park closing. 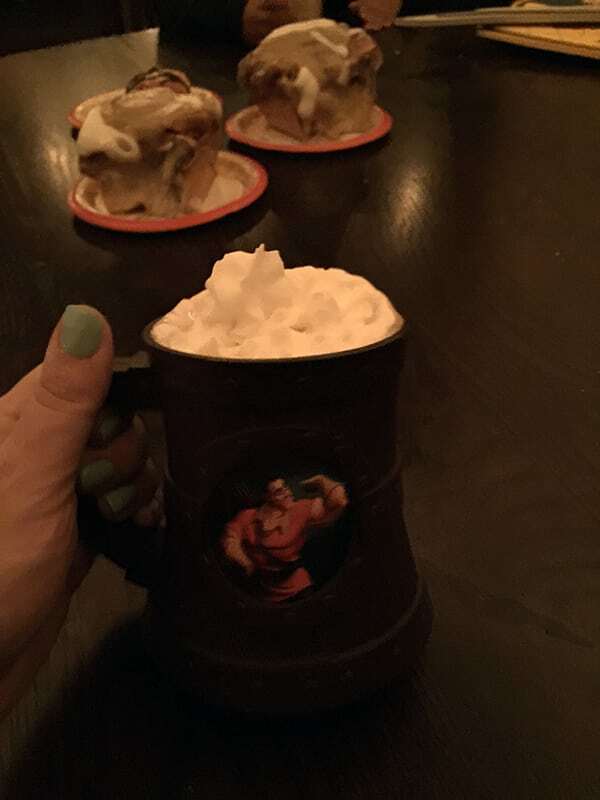 We shared the decadent cinnamon rolls and hot cocoa in a souvenir Gaston mug. The perfect late night snack! 15. 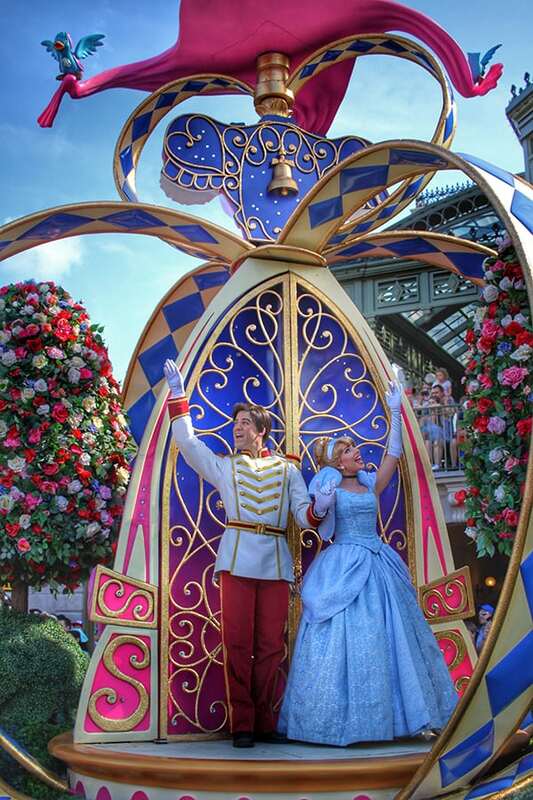 Be Our Guest – Put this on your must-must-do list!!! 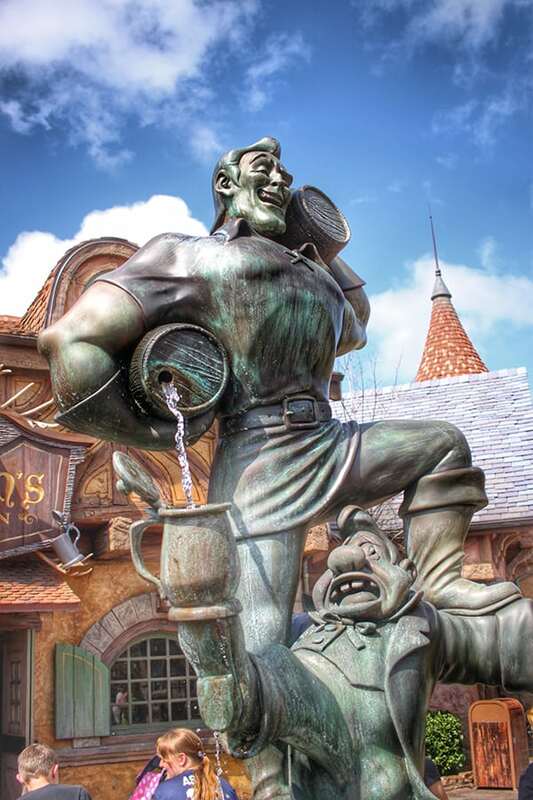 Also located in the New Fantasyland, Be Our Guest is the newest restaurant at Disney World. The reservations are hard to get, but after checking daily for about a week, I was able to snag a late dinner reservation and it was so worth it! 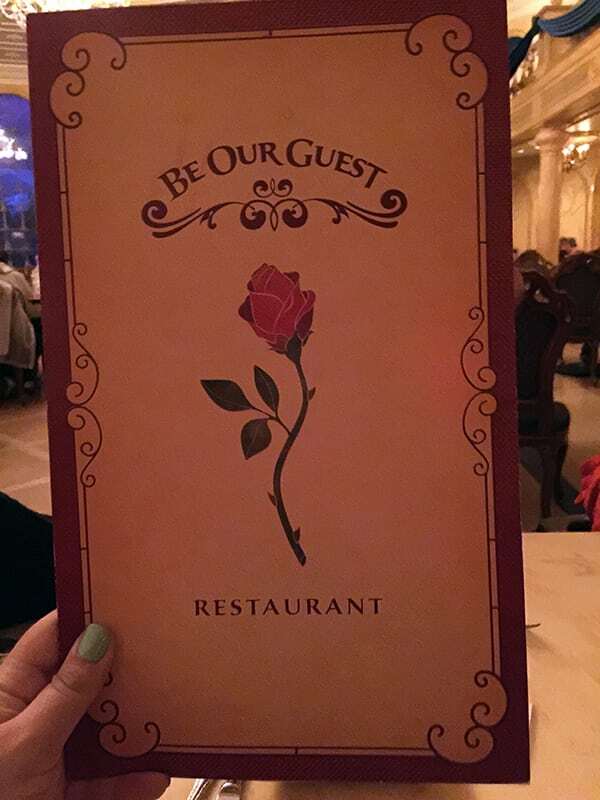 Be Our Guest is not just dinner, it’s an experience! The dining area is gorgeous and the details are a joy. Our server was so attentive and the food was delicious. Don’t miss the meat and cheese platter for an appetizer, the gourmet meat and cheeses are unbelievably tasty. They also offer “The Grey Stuff” for dessert! My husband had the Braised Pork and I ordered the Grilled Strip Steak with Pommes Frites. We both loved our meals. Our bigger kids each ordered a kids meal, the Grilled Steak and the Grilled Cheese with Tomato Soup, which were both very good. The Beast periodically walks through the dining hall, and after dining you can meet him and take pictures. Be sure to walk around the restaurant and see everything before you leave. 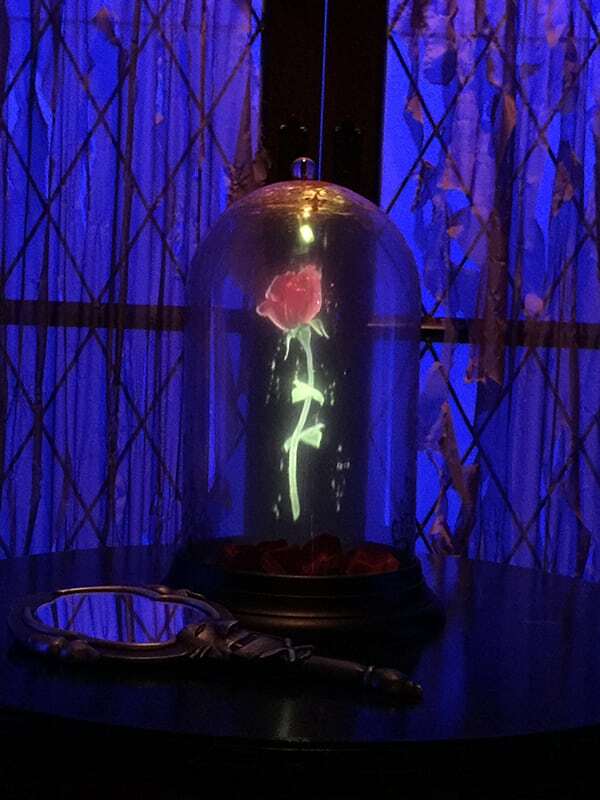 Each area has details you don’t want to miss like the magic rose and a beautiful snow fall outside the window. The snow is just beautiful! 16. Be Prepared for Rain – We took disposable rain ponchos and big umbrellas and were so happy we did. One day, it poured all day! If you are traveling with a stroller, don’t forget to cover it if you leave it parked if there is rain in the forecast! This waterproof stroller cover was perfect over our Britax stroller. 17. Animal Kingdom Park – Disneyland has nothing similar to Animal Kingdom, so this was all new to us, and we just loved everything. 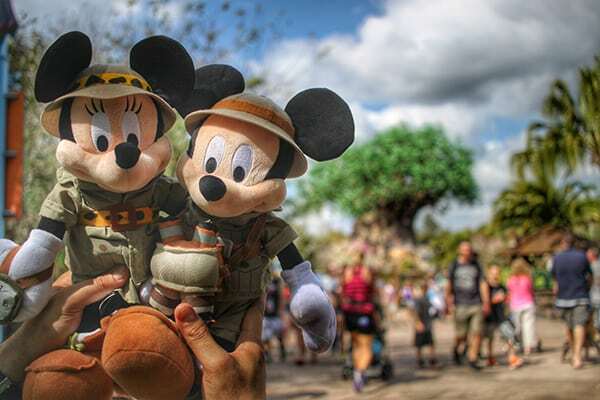 We couldn’t resist safari Mickey and Minnie – Safari Pluto was purchased, but not pictured:0) The Tree of Life is not to be missed and makes for great family photo opps! 18. 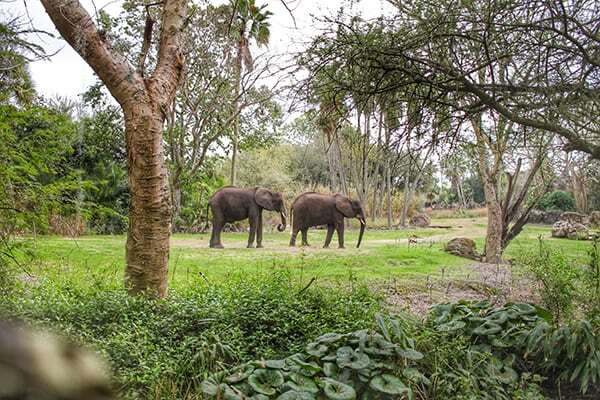 Visit the Kilimanjaro Safari Early – the animals were so beautiful and a huge hit with the entire family. I was not expecting to see the animals so close! This giraffe stepped out right in front of our car. 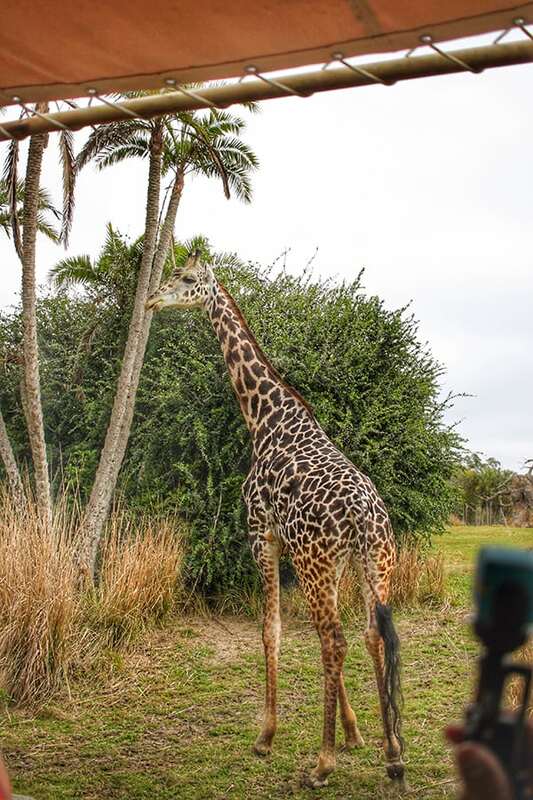 We had several people tell us the animals are most active in the mornings, so we headed straight to the safaris when we hit the park and we were not disappointed! We really just loved the entire atmosphere of Animal Kingdom and are defiantly looking forward to going back. 19. 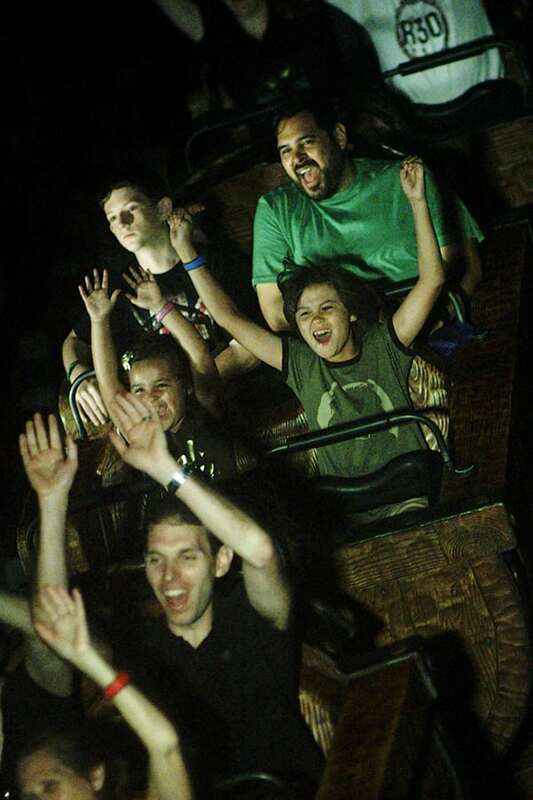 Ride Expedition Everest it’s another can’t miss attraction. It was my personal favorite! It’s a very cool roller coaster and had lots of great decor to check out while waiting in line! 20. Grab a bite at Restaurantosaurus – We had Angus Cheeseburgers and a Mac and Cheese Hot Dog here just for fun. It was a great place to eat with lots of space to spread out. The paleontologist college student theming was a lot of fun and gave our kids plenty of interesting things to check out during our meal. 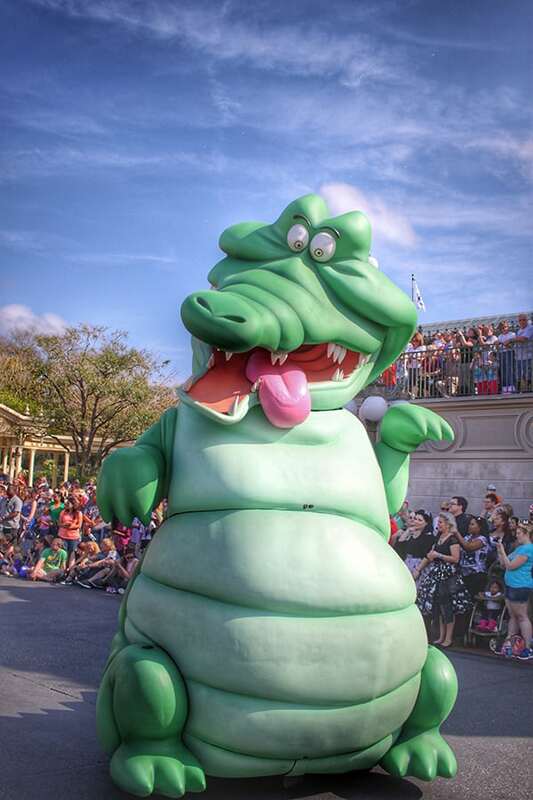 Restaurantosaurus was one of our favorite quick meals at Disney World. It has a fun casual vibe and great energy. 21. 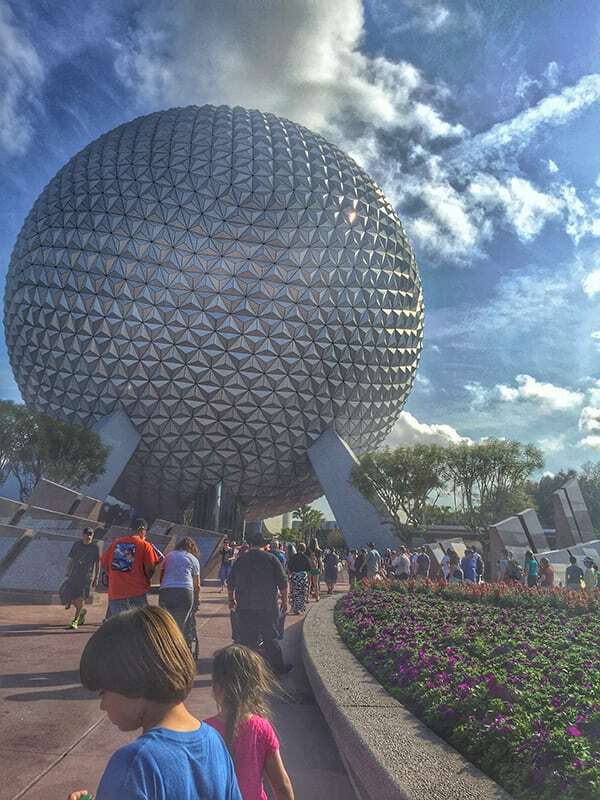 Epcot – The Test Track ride was on my kids must-do list and it did not disappoint. While they rode that ride with their dad, I cruised around the park a bit while our baby napped in the stroller. The topiaries were one of my favorite things! The details are amazing! 22. Dining at Epcot – We had reservations at Coral Reef for a late lunch and while the food wasn’t bad, it was our least memorable experience. It has a huge aquarium inside but, to be honest, the interior seemed a little dark and dated. If I had to do it over, we would walk Epcot’s World Showcase and get snacks from each country. We ran out of time this trip, so I’m putting it at the top of my list for next time! 23. 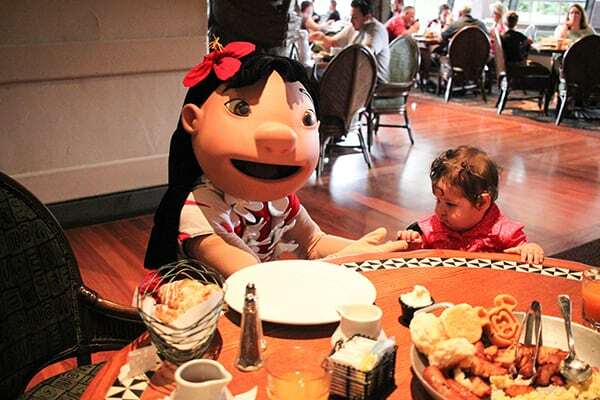 – ‘Ohana at the Polynesian resort is our pick for a great character breakfast. We highly recommend it, especially if you have little ones. 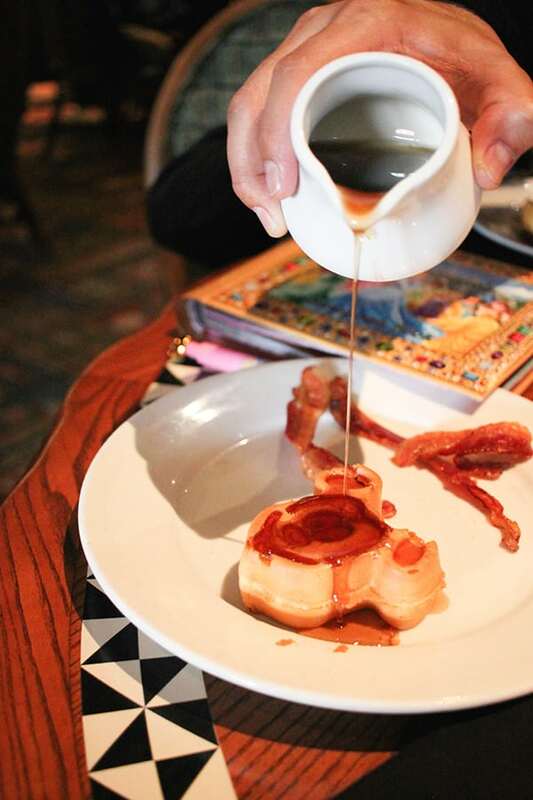 It’s the only character breakfast served family style instead of buffet style. Plus, the resort and restaurant are beautiful! 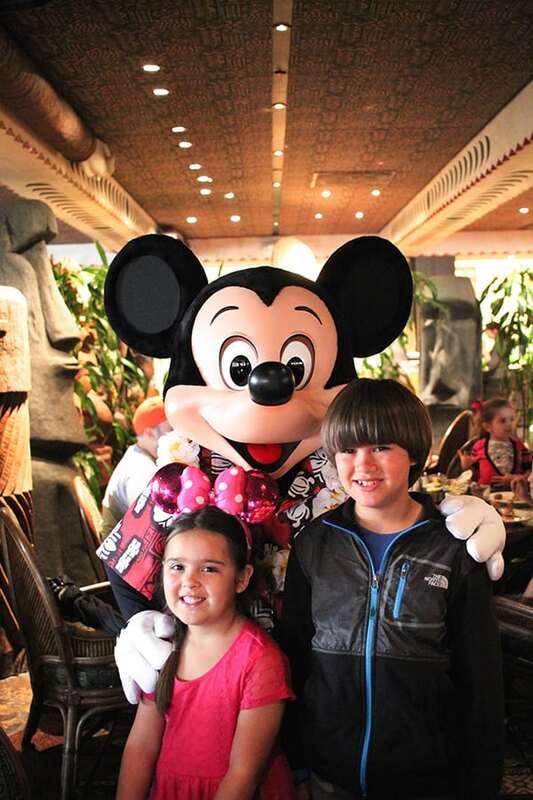 Mickey in an Aloha shirt! It was so nice to relax at the table and have the food come to us! 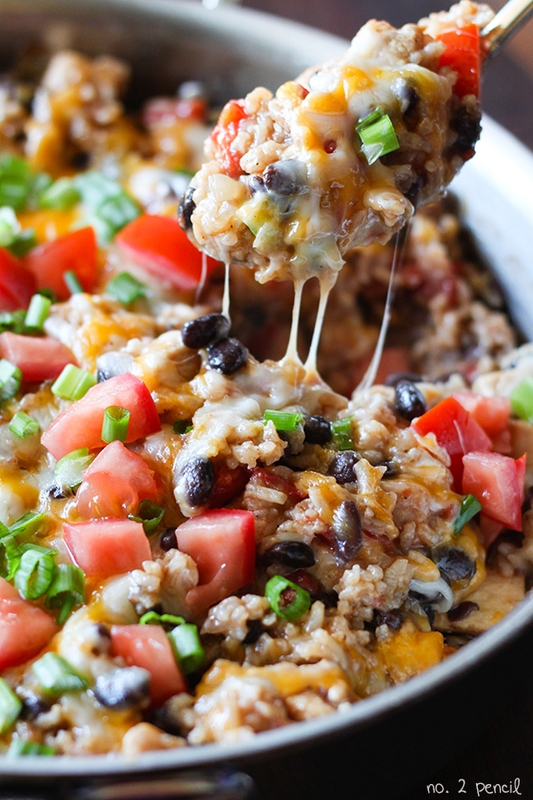 With three kids and two parents, coordinating a buffet can be tricky! We are Lilo and Stitch fans, so it was a great fit and a lot of fun! 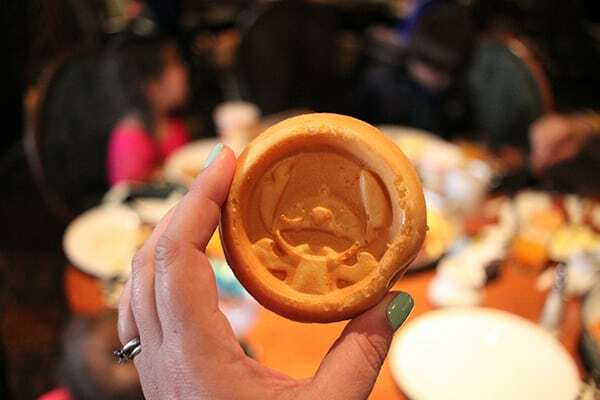 They even have Stitch waffles! Plan on making a reservation and arriving early. The line for check in was pretty long! 24. Buttons – If you are visiting for the first time, or celebrating a special occasion, ask your nearest Cast Member where you can get a free button. They make great souvenirs! 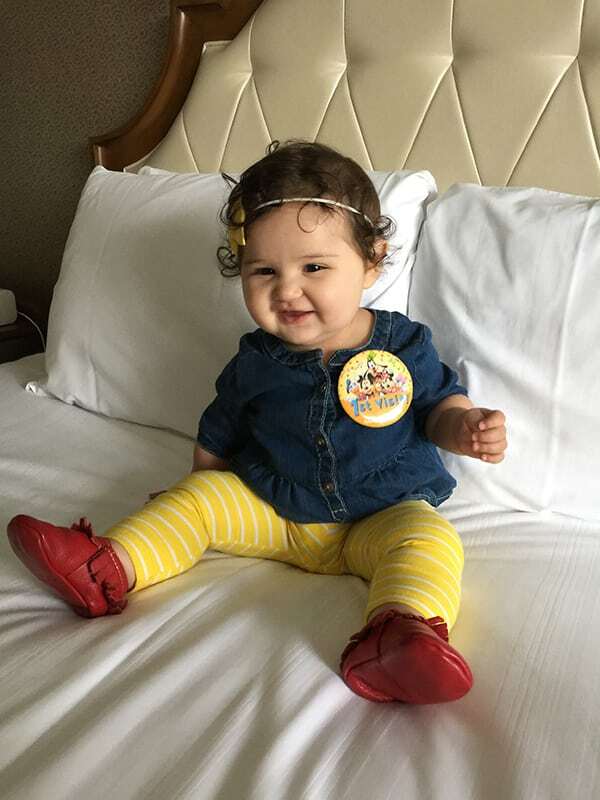 Here is my littlest cutie sporting her 1st visit button! 25. Pressed Pennies – There are unique pressed penny machines everywhere at Disney World (and Disneyland too)! We found them at the parks, the resorts, and restaurants. 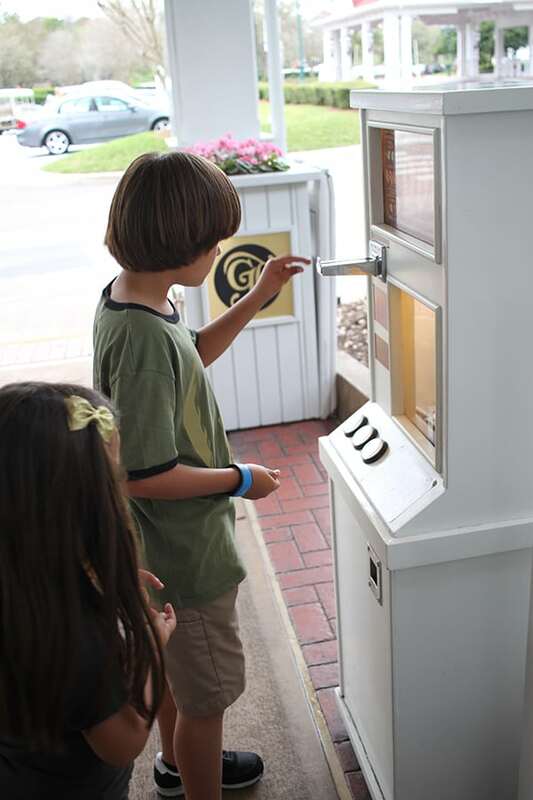 My kids absolutely loved being on the lookout for pressed penny machines on our trip. Each pressed penny is fifty-one cents, so we dug through our change and took a bag of quarters and a bag of pennies. We also purchased pressed penny books once we were in the park for our kiddos to keep them in. One of my favorite memories from our trip is trying to use up all our change on pressed penny machines as we left the park! 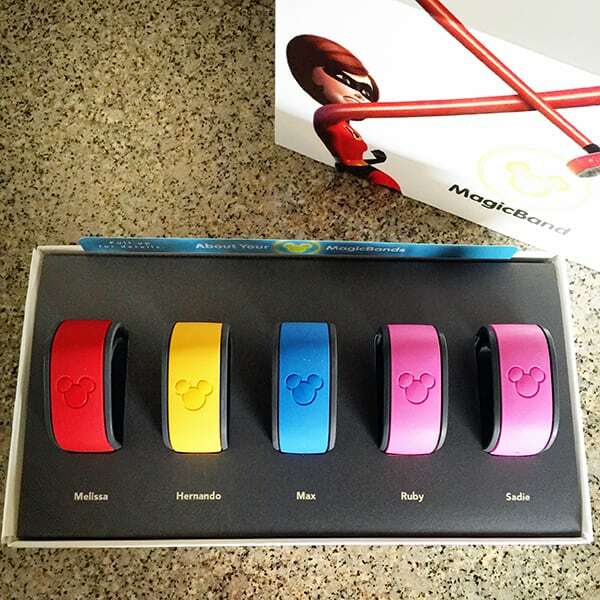 You can even personalize your MagicBands with Disney MagicBands Accessories . I love the Mike Wazowski slider! 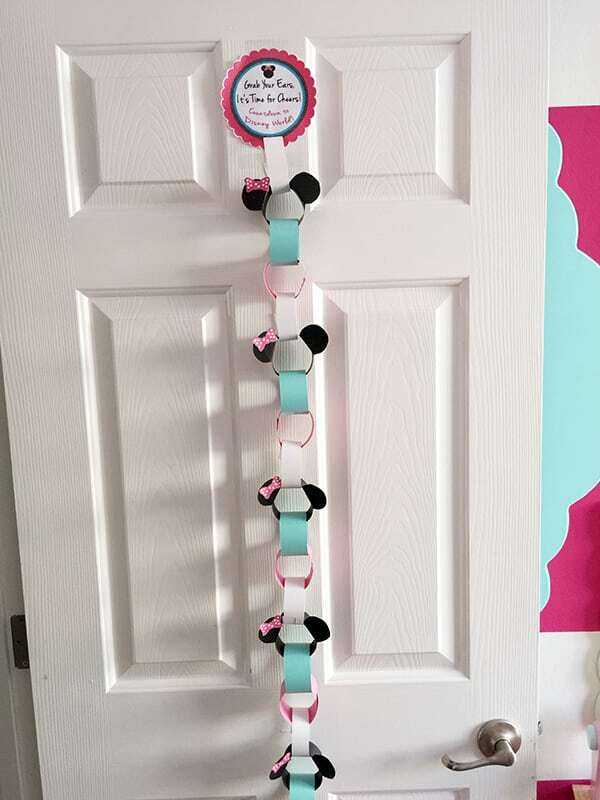 We downloaded both versions of the Disney World Countdown Chain from Get Away Today and talked about our trip a little bit every night. They have a Minnie and a Mickey Version! To be honest, I feel like I could add to this list for infinity, there are so many exciting things to experience at Disney World! Our family can’t wait to go back. At the top of our list for next time is visiting Hollywood Studios (we ran out of time! ), Eating at the Sci-Fi Dine-In Restaurant at Hollywood Studios, Chatting with Gaston outside of Gaston’s Tavern, and riding the Seven Dwarfs Mine Train (again and again!). 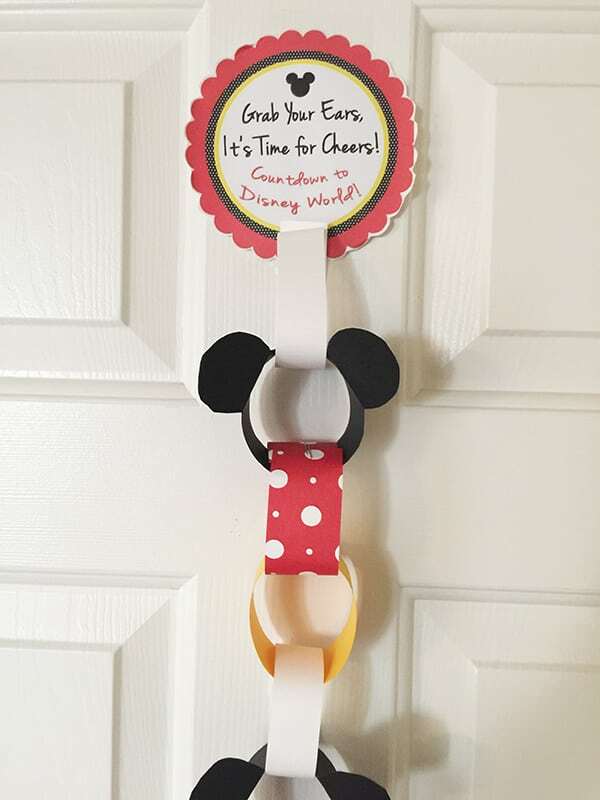 I would love to see your favorite Disney World Tips in the comments! If you are traveling to Disney World, consider visiting the Wizarding World of Harry Potter at Universal Orlando as well! It is amazing! See my tips for the Wizarding World of Harry Potter here. 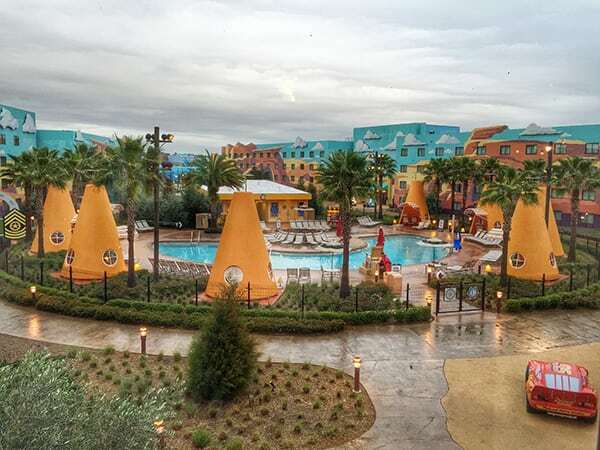 Our trip to Disney World was part of the Food Blog Forum which is an amazing conference and experience for food bloggers. I was thrilled to be able to snag a family ticket last year. 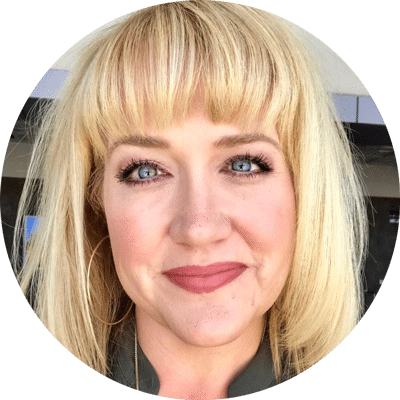 If you are a food blogger, I highly recommend this conference! Thanks for sharing your tips! 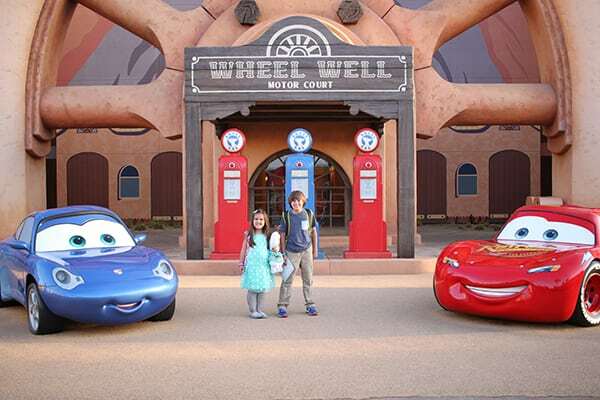 We are planning our first trip for April 2016 and we’re staying in Cars Suite at the Art of Animation. Can’t wait! Oh my goodness, you guys are going to love it!!! The suite was so awesome. Have an amazing time!!! this is just the best list! 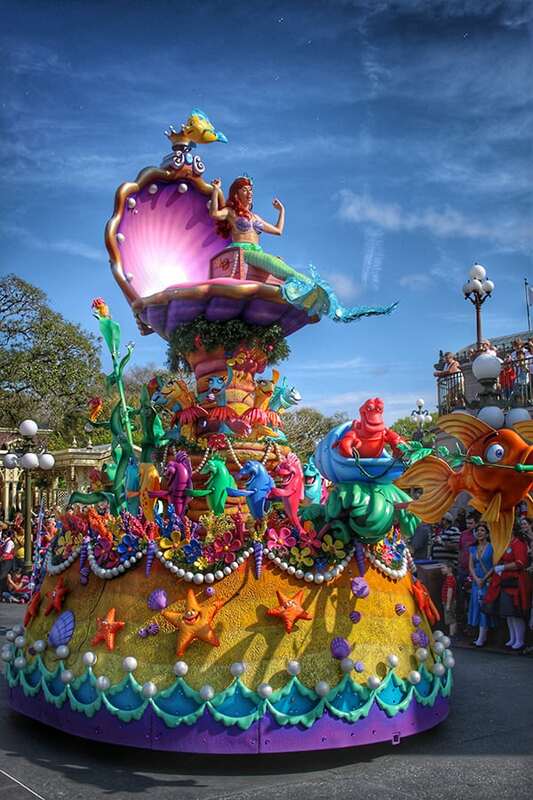 We’re taking our kiddos in February 2016 and staying at AofA in a little mermaid room for our daughters 6th bday. It’s such a big deal for us! I’m so glad to read that you could swim in February. There isn’t much info out there about winter stays! Cheers, thanks for the awesome post. Have a wonderful trip! We walked over to the Little Mermaid area and took tons of pictures! It is so cool! Love these tips. We are heading there in feb 2016 and we cannot wait! Silly question, the last time we went the pictures I took of the parade were horrible. I have a canon t3i. What lens did you use? So fun! If you follow the link under item six, it will take you to the lens that I used. It’s very affordable! Staying at Art of Animation in May and glad to read your good reviews of it! Have a wonderful time!! You will love it! Thanks for all your tips. We are staying at AofA in March. Our girls are 14 & 17 now but are huge Disney fanatics. Last time we were at Disney World, they were 4 & 7, so a lot has changed. Last big trip before the older one goes off to university and she really wanted to go back. Your pics are gorgeous – I’ll have to looks at the lens you were using – we have a Canon T3i. Now off to read your tips about Harry Potter since we’re going to Universal after Disney. Love this article! But more obsessed with your photos- omg! What camera did you use? I can only hope my photos come out as well as yours. Thank you so much! I use a Canon Rebel with a wide angle prime lens. I have a link to the lens on Amazon above! It’s very affordable!!! These are great tips! No kids but my husband and I are staying at Art of Animation in May. 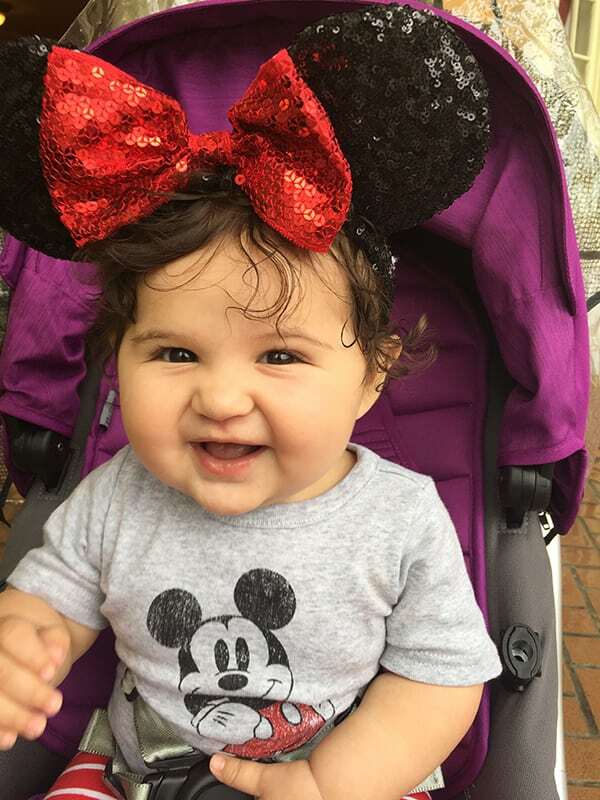 Our first time staying there and his first time at Disney. So excited! Have a wonderful time! My only regret is that we didn’t get to hang out by one of the pools! Thank you for all your wonderful advice. I have a question about your camera. I too have a Canon DSLR. I was toying with the idea of buying a mid range telephoto lense. I currently have the 18mm – 55mm lense that came with the camera. Just wondering what the wide angle lense was you bought and if you were pleased with it, if you wished you had something different, etc…. Thanks so much! I have a link to the lens on amazon I use in the article under tip number size. Just click were it says wider angle lens. It is very affordable because it’s a prime lens, so it doesn’t have zoom, which may take some getting used to. A prime lens gives you a lot of bang for your buck because it takes nice sharp pictures! I use it for all my travel pictures and pictures around the house. It’s similar to the popular “nifty fifty” prime lens, but it’s easier to use in a small room and on trips because you can get more in the frame. Let me know if you have any more questions, I’m happy to help! Just got back! FYI Ohana is not the only family style character breakfast. Garden Grill had a wonderful family breakfast with Chip, Dale, Mickey, Pluto, and others. And you sit in a circular station that rotates giving you a view of different landscapes from the Land of the Living ride. Don’t worry, it rotates so slowly you can’t even feel it. And when you get done you can hit up the 3 attractions in the same building with almost no lines, including one of my favorite rides Soarin’. Just wanted to share that for future reference. We greatly enjoyed it! I much prefer the family style over the buffet. Thanks for the update! Hopefully we will be back soon to check out Garden Grill! Love these tips! We are definitely leaning towards the Art of Animation as my eldest is OBSESSED with ‘Cars’! Your countdown idea is amazing, I am bookmarking this for later! That is a great tip about leaving your stroller covered when you go on the rides. The rain is so unpredictable in Florida and the worst thing is to find that your stroller is soaking wet! It’s so true! Thanks for the comment! Had a blast in walt disney last year. We really enjoyed the vacations. We tried many food, but the mocktails were awesome at restaurants.